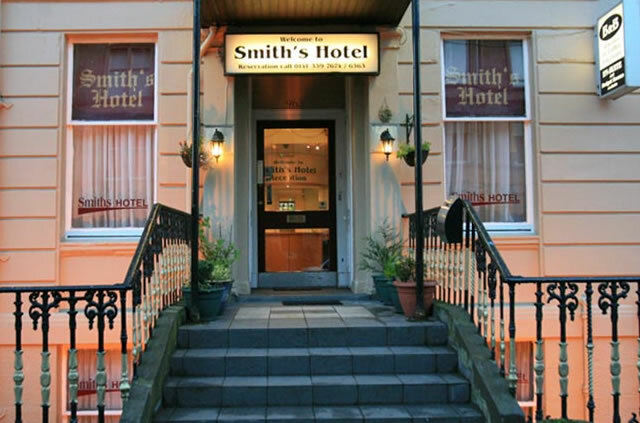 Housed in an elegant Victorian terrace in Glasgow’s Sauchiehall Street, The Smiths Hotel in Glasgow is an independent, family-run establishment offering patrons comfortable bed and breakfast accommodation at budget rates in one of city’s most exclusive quarters. Guestrooms are available in various configurations ranging from single basic to family en-suite, each meeting accommodation requirements for business travellers, individuals, groups and families visiting Glasgow. As part of each accommodation package, personnel at the Smiths Hotel are pleased to provide guests with a complimentary Scottish or Continental breakfast served in the luxuriously appointed dining room, designed with a contemporary feel. The hotel's dedicated team of personnel also ensure that impeccable levels of service and standards are continuously maintained throughout the hotel, and also pride themselves in having a strong focus and long-standing experience in hospitality and customer care. Check-in times are between 15.00 and 23.00 on day of arrival. Free parking at the rear of the Smiths Hotel subject to availability. A full Scottish Breakfast is available daily from Monday-Saturday 7.00am till 9.00am; Sunday 8.00am till 10.00am.